For a while now, customers have been asking for a “slim” version of the original Modern clip, which is a wide clip that’s really suited for very large pens. Now a Slim version is available, featuring the same clean, strong lines. Below are pictures of both clips side by side. The Wide model is 6.6mm wide, while the new Slim model is around 5.2mm wide. Pricing on the Slim Modern clip will be $18 for bronze or brass, and $20 for silver. Like all my other custom clips, this original design is hand cast using the lost wax method by Mike Redburn of Silver Pen Parts. 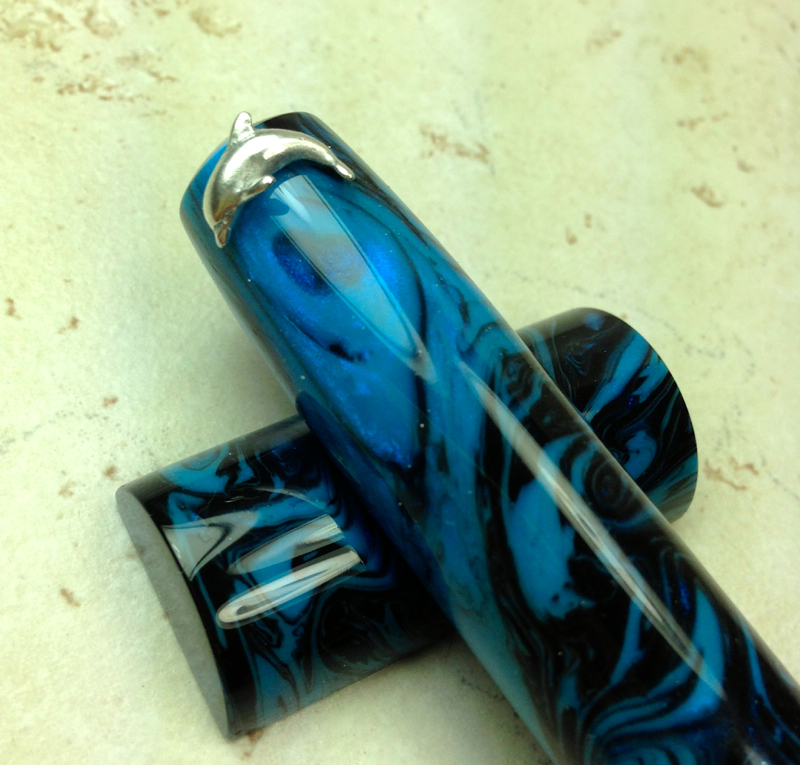 Check out the Clips page to see all the Scriptorium Pens clip offerings. Tomorrow, Friday, November 6, 2015, is Fountain Pen Day! Celebrate with Scriptorium Pens and save $20 off every order placed between 12:00am & 11:59pm,CST, Friday, Nov. 6th, 2015. 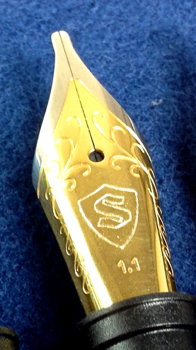 Scriptorium Pens has added a new tool to help customers design their perfect pen. I’ve created a Customer Worksheet that is very similar to my own order form that I keep for each customer, with the same basic information. This is a pdf document that you can print out and use to play around with various pen configurations and prices until you come up with your ideal combination. I think this will be a really helpful way to ease the process of deciding on all the various options offered by Scriptorium Pens. It contains all the information I need to put your new pen together. I’ve also added a page of Configuration Examples with a breakdown of their pricing to help customers see how things add up. These examples are similar to those in the final confirmation email I will send to make sure the order is correct. Finally, one more item I’ve added is Order Numbers! That’s right! With the orders continuing to come in, I’ve started assigning numbers to each order to help keep track of them. From now on when you place an order, I will give you your order number. For anyone already in my work queue, you can send me an email to find out what your number is and what order I am currently working on. Earlier this year a long-time customer asked me if I could create a pen styled after one of the Carter’s INX pens of the 20’s & 30’s. I was intrigued. I knew of the famous Carter’s inks, and even have a small collection of their vintage ink bottles and advertisements. I knew nothing about their pens, though. The customer provided some pictures to help me get as close as possible to the original style, but he wanted the new one in a much larger, modern size. I fell in love with the slim, elegant, streamlined design, and knew I had to get a custom clip made to finish off the look. Mike Redburn, of Silver Pen Parts, worked wonders with a new clip that is reminiscent of the original but stands on its own as a beautiful creation. The customer carefully chose a material that would fit the vintage look, Pistachio, an acrylic from Conway Stewart, and asked for a black acrylic band between the two silver cap bands for contrast, along with a black section and finials to top it off. Before the pen was even finished, I had decided to make it a regular model in the Scriptorium lineup. Check out the page for the new Inkling here! 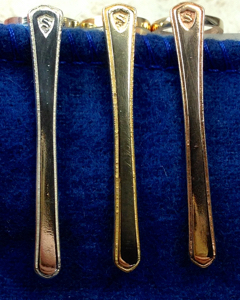 The Nouveau clip, featuring the Scriptorium Pens logo, has arrived! 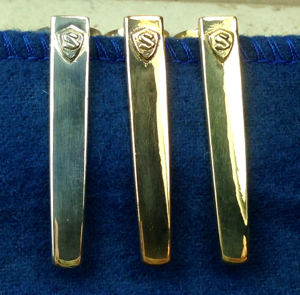 Hand cast using the lost wax method, and offered in Sterling Silver, Solid Brass, or Solid Bronze, the Nouveau adds an understated, elegant style to your choice of clips. This new design joins the Classic and Modern styles as an upgrade to the standard style. Visit the Clips Page for details on all clip choices. 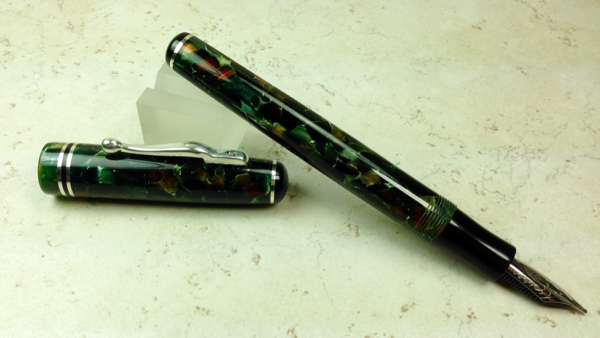 The Idyll is the latest model from Scriptorium Pens. 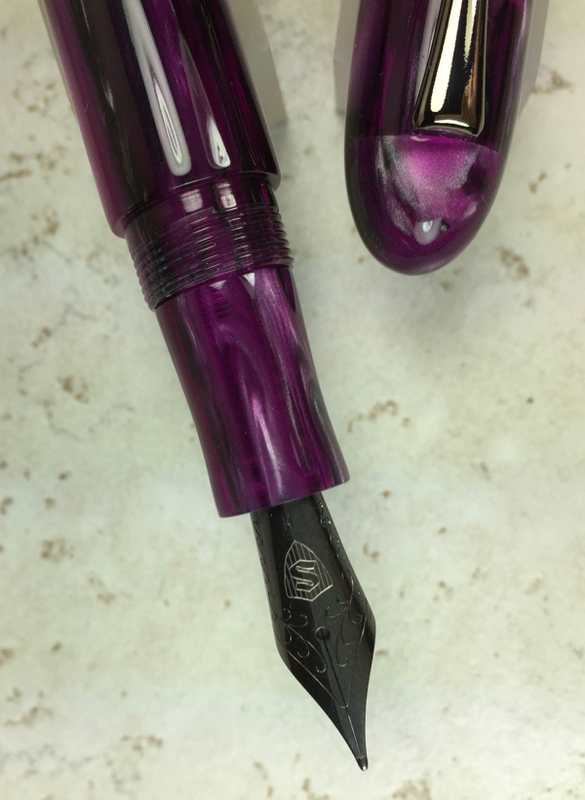 After receiving many requests for pens with a flush cap and barrel body style, I decided to add one officially to the line up. This one went through several prototypes to reach the final shape/profile. It features clean, minimalist lines in the Japanese style and looks great whether clipped, clipless, or with a roll stopper. Check out the Idyll page for more images! Unicorn Roll Stoppers? Dragonflies? Celtic Knotwork? You name it! Roll Stoppers! 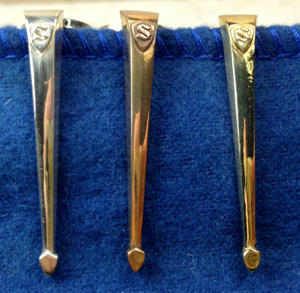 I’m proud to announce that Scriptorium Pens now offers Sterling Silver Roll Stoppers as another way to personalize your custom pen. Maybe you’ve always wanted a pen with a unicorn on it, or happen to love dragonflies, or would love to have a little kitty cat draped over the top of your pen. I can provide those or just about any design you can think of. I’ve always wanted to offer roll stoppers, and when a recent customer asked for a dolphin roll stopper, it was time for me to learn how to make them. I love learning to do new things, and this was a totally new experience because I had to learn silver soldering with a butane torch. After lots of practice, I finally mastered it — and without burning the house down. 🙂 The technique involves desoldering the thin post on the back of an earring, then soldering on a much thicker copper post that will allow epoxy to firmly hold the stopper in place in a little hole drilled in the top of the pen cap. Below are some of the stoppers I have on hand right now, and I can probably find anything else you may be looking for, whether it’s a winged Pegasus, a faerie, a motorcycle, a snake, an Autumn leaf, or whatever. Roll stoppers are a way to make your pen truly unique, truly yours. Check out the Roll Stoppers page for more info. New Pen Model — the Epic! The Epic is pretty much exactly what I think of when I envision fountain pens, and this model started out as a pen I made just for myself this weekend, and I liked it so much, I decided to make it part of the regular offering. 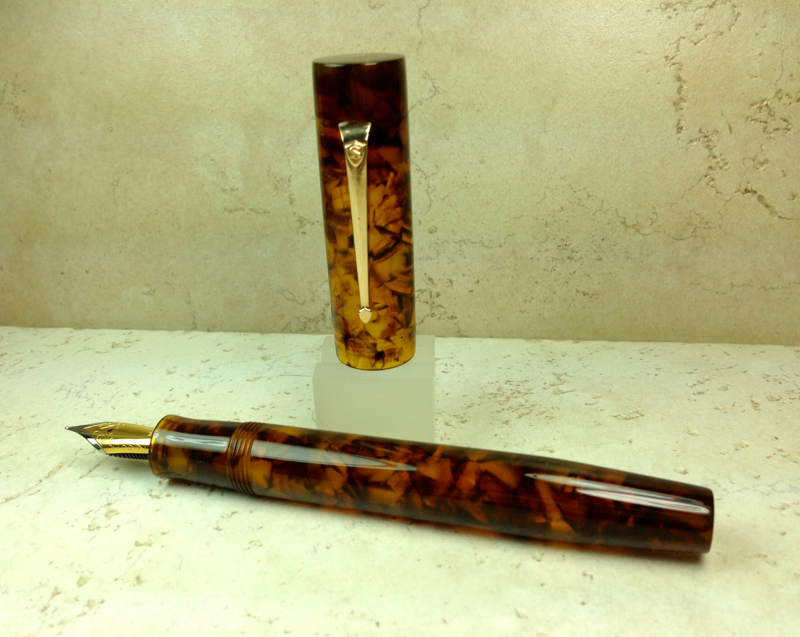 I rarely make pens for myself, and this is the first one in at least a year and a half. Like its literary namesake, the Epic is big and bold. Long, clean lines create a pen that is strong and grand without being ostentatious. The barrel expands ever so slightly toward the end before making a sharp taper downward. Though similar to the expanding barrel on the Balladeer, the Epic’s barrel is much slimmer, with only a slight swell at the widest point of diameter. This design helps to keep the pen from slipping down in the hand. Check out the Epic page for more images. 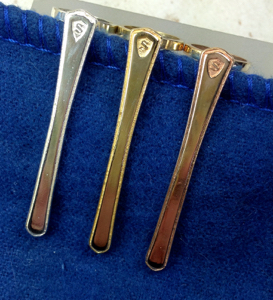 The new custom clips in Bronze and Brass are now available in both Classic and Modern styles, joining the Sterling Silver clips for a choice of colors to suit your pen material. 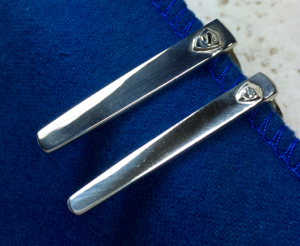 These clips are hand cast using the lost wax method and are solid, not plated! My favorite is the Bronze. 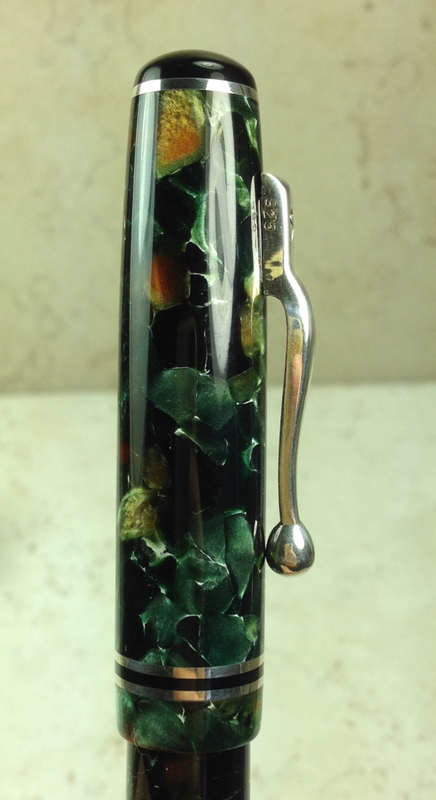 I love the patina it develops over time, adding unique character to a pen. 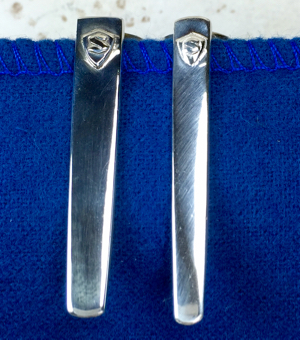 These custom clips are available as an upgrade option to the standard clip offerings. See the new Clips page for details. As mentioned above, there’s a new page just for Clips. Many customers have asked for a page with pictures of all the clips to choose from, so here it is! I’ve included both front and side angle views. I’ve also updated the Pen Model Dimensions Chart to reflect the full Scriptorium model lineup to date.